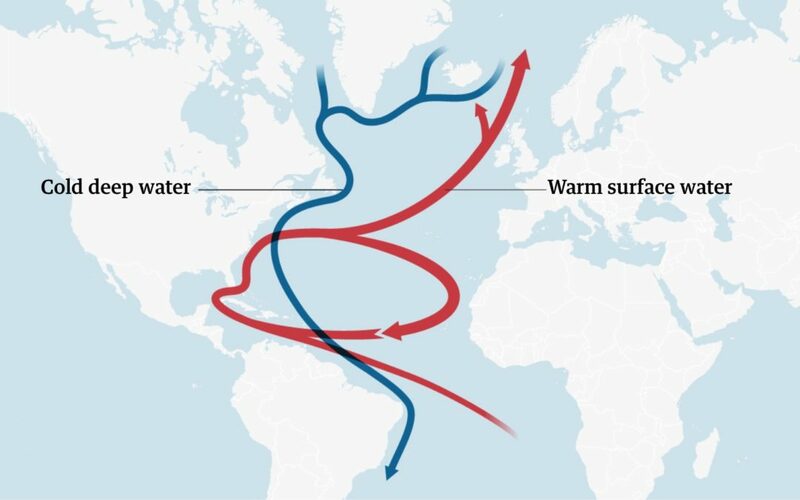 SNIP: The warm Atlantic current linked to severe and abrupt changes in the climate in the past is now at its weakest in at least 1,600 years, new research shows. The findings, based on multiple lines of scientific evidence, throw into question previous predictions that a catastrophic collapse of the Gulf Stream would take centuries to occur. Scientists know that the Atlantic Meridional Overturning Circulation (AMOC) has slowed since 2004, when instruments were deployed at sea to measure it. But now two new studies have provided comprehensive ocean-based evidence that the weakening is unprecedented in at least 1,600 years, which is as far back as the new research stretches.